Friendships grow stronger over years, and eventually most will find a level and stay there. Others will fade away, growing more distant and out of touch until they are consigned to slowly die on Facebook. And then there are those that are different. Relationships that have survived for so long, and through so much, that even if they fade, their half-life is such that they will never really extinguish. The kind of friendship that doesn’t require maintenance, or regular contact. One that can be picked up after an absence of years as easily as after a few days. I sometimes think these friendships are more easily formed when we are younger. Formed in adolescence, shaped by the unsteady hands of youth and unstable yet steely strong forces of college, there is very little that can weaken them thereafter. Of course, knowing anyone that well is, if anything, a mixed bag of meeples. With the exception of Aileen, almost no-one knows me as well as Ger, and that means no-one knows how to wind me up as well as he does. I’m not saying he would ever actually set fire to a game. But he would certainly take delight in the idea, or at least the suggestion of it. It’s almost like we have reached a stage of knowing each other for so long that normal interactions have lost any meaning or interest, and the only worthwhile mode of communication left is pushing one another’s buttons. Maybe this is just a ‘guy’ thing. Maybe after too much time in each other’s company we rub each other the wrong way and we just have to let off some steam. Then again, maybe it isn’t normal that nights out are as likely to end in drunken chases through unfamiliar streets as they are in a bar watching football. 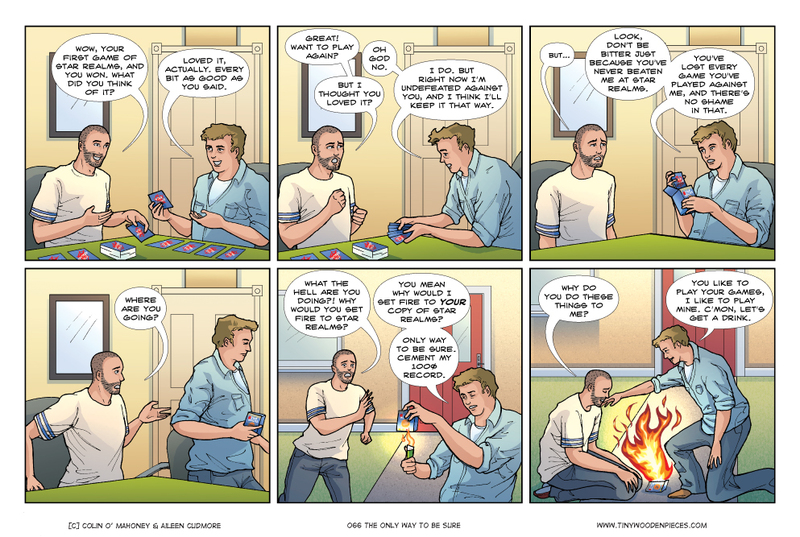 But if life was normal, then I probably wouldn’t have anything to write about underneath a comic on the internet about board games and other wonderfully nerdy things. Wow, sounds like your raising a good ‘un there with your son. Good job! Thank goodness you weren’t playing the tablet version.